It all started as a joke, but then turned into a shirt with your help! A few weeks ago, I made a spoof of a ZipCar ad that was poking fun at cyclists. Being a big zombie fan, I made a mock ad using an image from The Walking Dead. It got us thinking that in the event of the zombie apocalypse or any other disaster that called for mass evacuations, the bicycle is way to go! So we put up some mockups on Facebook and with input from our readers we have the final shirt design and its ready for sale! We’re using SpreadShirt as our printing and distribution since they seem to have the best print quality on the shirts. Order your Zombie Apocalypse shirt today! After enough requests we added a few more designs. One is a version of the cargo bike shirt with an Xtracycle/longtail. While we won’t be able to create every type of bicycle out there, the Xtracycle was a seminal bike in the cargo bike revolution. I used one personally when I first started my photography career so it has a special place in my heart. I also added a “Bike Local. 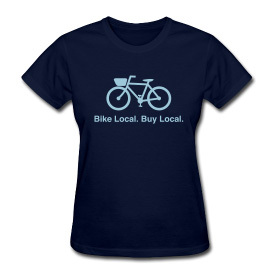 Buy Local” shirt, which fits in with one of the themes we’ve been exploring – how bikes can benefit small economies. Thanks for all your help. As always, all sales help keep us on the road. We’re trying to get to New Zealand, so we need to sell lots of shirts. Order one today and have one for your bikey Halloween party or every day! If you have other products you think the design would be great for, let us know! I’ve wondered aloud for years why none of the protagonists in the classic zombie films are on bikes. 28 Days Later is most surprising in this regard considering the main character was a bike messenger in pre-zombie days. That is freakin’ awesome,as a cyclist and a fan of Zombie books and movies this is right up my alley. I love it! If you’ve ever read the Zombie Survival Guide, this is one of the top 10 rules. Get a bike! I can’t wait for my tee, and I’m considering ordering some more for present if it looks good. Great idea! 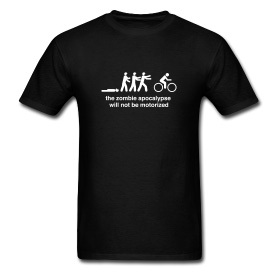 Like these T-shirts. Thinking of picking some up for my son and his family. I see a children’s option, great. I notice only one graphic for the children’s choice though, the Xtracycle and not the Bakfiets. Why would that be? Love the t-shirts. I’m ordering several. 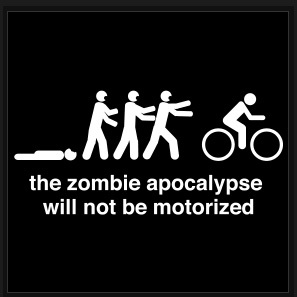 Have a friend who cycles with me periodically who is a HUGE fan of zombies. I think this t-shirt might make him even more committed! My daughter told me that my ex-wife was watching The Stand on DVD with our kids recently, and wondered aloud why one of the movie characters was riding a mountain bike.